This seems to generate a lot of questions and queries so thought I’d do a quick walkthrough. You may want to jot these variables down somewhere to reduce confusion. First of all you need to install MariaDB, now one of the stipulations of Nextcloud is that it requires binary logging to be enabled on the MariaDB server. I’ve already got one instance of MariaDB installed without binary logging so I’m going to install a second container to use with Nextcloud. The newer versions of MariaDB come with binlogging enabled out the box by default, so you could use an existing container for your Nextcloud database if you're already using our container. You will still need to make the changes below though. 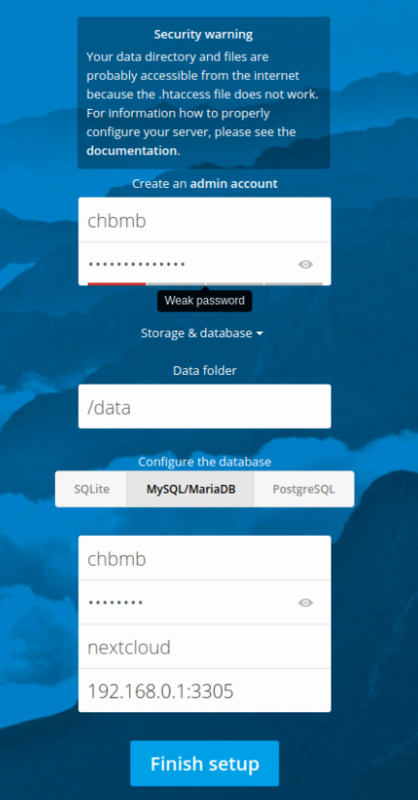 Personally I prefer to have a separate MariaDB instance for Nextcloud and leave the config of my exisiting databases as is. Add the MariaDB container as usual, you need to change three things if this is a second container. Add the container. That’s this bit done. Next open up a terminal connection to your MariaDB appdata folder using putty or another SSH client of your choice. It's preferable to do it this way as it doesn't affect the file permissions or ownership if the custom.cnf file, whereas I've noticed a lot of users doing this through Windows & Notepad++ have run into problems regarding this. Then navigate to your mariadb appdata folder. And edit the custom.cnf file. Press Ctrl+Shift+_ or Ctrl + _ (depending on your keyboard type/country) and type in 124 then press Return to take you to line 124 and change it from #bind-address=0.0.0.0 to bind-address=0.0.0.0 note the removal of the # symbol. Press Ctrl + x then type y then Return to save. Now restart the MariaDB container to implement this change. First thing we're going to do is create a MariaDB user for the database. Add Nextcloud from Community Applications, and fill in the docker template. /data should be mapped to where you want your shared files stored on your array. I’m using /mnt/user/nextcloud/ Note I've changed the host port to 444 so it doesn't conflict with my LetsEncrypt reverse proxy port which I've left on the default of 443. Then install it and give it a minute or so for the file to be inflated before trying to access the webui. 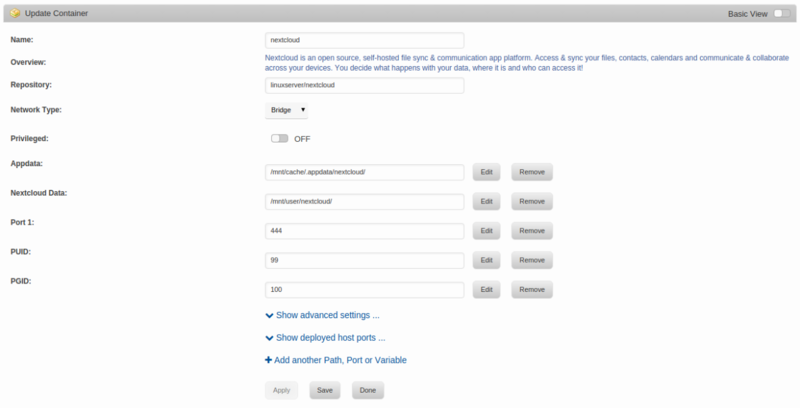 Open the webui and you need to fill in several items. Then click Finish setup and wait for the Nextcloud webui to appear. I’m going to show the recommended way to reverse proxy nextcloud with our Letsencrypt container. This guide assumes you already have the Letsencrypt container up and running. We're going to put Nextcloud on a dedicated subdomain, such as https://nextcloud.server.com. The reason for this is explained here. Nextcloud actually run a security scanning site at https://scan.nextcloud.com/ and the maximum grade you can get using https://server.com/nextcloud is A compared with A+ on https://nextcloud.server.com. Not going to get into the argument here, but this is an excerpt from a blog post from Nextcloud about why they arrived at this conclusion. The Same-site cookie support in Nextcloud 11 has been hardened even further. Same-Site cookies are a security measure supported by modern browsers that prevent CSRF vulnerabilities and protect your privacy further. Browsers that support same-site cookies can be instructed in a way to only send a cookie if the request is originating from the original domain. This makes exploiting CSRF vulnerabilities from other domains a non-issue. Also timing attacks, such as enumerating whether a specific file or folder exists, are not feasible anymore. Nextcloud enforces the same-site cookies to be present on every request by enforcing this within the request middleware. As hardening measure, in Nextcloud 11 we have added the __Host prefix to the cookie if the environment supports this feature. This enforces the cookie to be only sent via HTTPS and only be sent only to the host that has set this cookie. This mitigates cookie injection vulnerabilities within potential third-party software sharing the same second level domain. Note that Nextcloud does also employ regular protections against CSRF such as a shared secret between browser and client. Same-Site cookies are just considered a security hardening. More technical details about the original implementation can be read in this blog. Before you tackle this, make sure you actually have setup a domain setup with it's DNS pointing to your server. your actual domain name, and edit the proxy_max_temp_file_size parameter to a size appropriate for your use. Once that's all done restart the Nextcloud and LetsEncrypt containers and all should be working.